The muffler has been around for many years, serving as a staple on vehicles to reduce harmful emissions from traveling into the air. At Country Muffler, an auto repair shop in Columbia Falls, MT, they honor this history by specializing in both custom exhaust and muffler installation and repair. Well known for quality exhaust systems and honest workmanship, they have provided professional repairs and services for locals throughout the area for 33 years. They will show you what needs to be serviced and explain their solutions in detail when repairing your vehicle so that you know exactly which repairs are being completed. They are able to replace or repair every part of your exhaust system including, exhaust manifolds, catalytic converters, and resonators. As a local auto repair shop, they pride themselves on giving their clients competitive pricing on installations and repairs with hometown quality customer service. 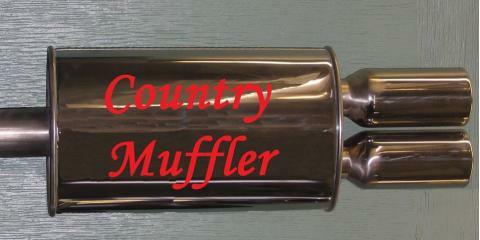 Visit Country Muffler, for an auto repair shop that truly focuses on the satisfaction of their customers. Call them today at (406) 892-3496 to schedule an appointment or visit their website for more information.